Driving home last night from Eliza & Tim’s grand New Year’s eve wedding, 15 minutes to midnight, we spent the road trip reminiscing. We mostly smiled and laughed about the cracking good times, and also about the fun ‘behind the bar’ stories that don’t always make the headlines – but really are how we remember the year, and are the reason we LOVE what we do. Unlike some other event supplies, we are at events from the start, right to the end, so we see it all! Here goes…our 16 most memorable moments celebrating 2016. 1 || The night a flash mob performed at a 50th birthday party, on the road, stopping traffic, to YMCA! 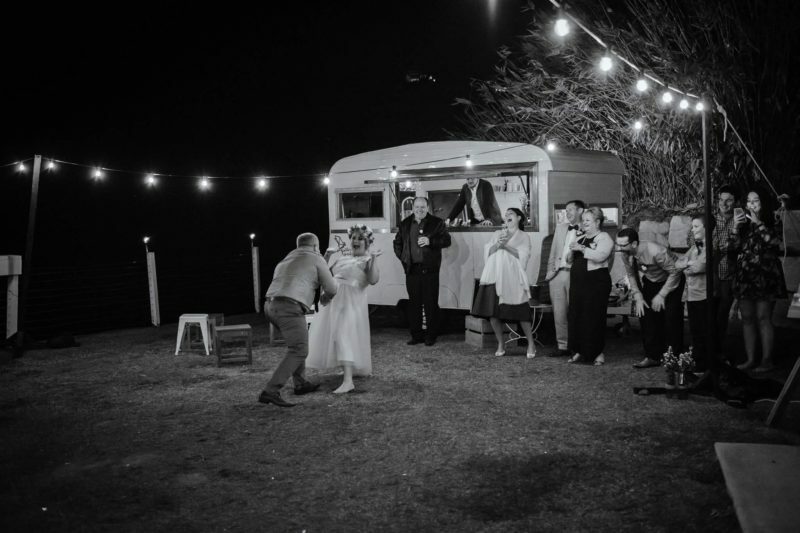 2 || A 20 minute firework display for a cracking couple in the Maleny highlands, just because. 3 || When a beautiful bride unexpectedly performed the ‘worm’ dance move, in her wedding dress. Tamika you legend! 4 || When a couples friend is a wine sommelier, and for their engagement party every single bottle of red, white and champagne was unique. 5 || A not so near miss, when an out of control guest ran the golf buggy into the caravan. 6 || Serving a ‘unicorn’ our specially designed cocktail. 7 || When the entire wedding slammed down vodka shots immediately after the ceremony, to celebrate Polish tradition. 8 || Being escorted to hand pick the wine from a clients underground marble cellar – drool! 9 || Serving drinks perched next to triple tipi tent set -up…magic. 10 || A bride and groom cashed in their Go-Fund Me contribution to fly in a rock band from Melbourne to perform as the headliner at their wedding. 11 || When an afternoon QLD storm rolled in, wiped out the entire venue’s power, and we still had a killer event (in the rain), run completely on generators. 12 || Witnessing two talented brides, belt out love songs for their new husbands. 13 || The day Pokemon Go launched, we were at South Cross University, and had dozens on university students attempting to catch the little things, right off of our bar. 14 || This year we have mastered positioning the caravan fitting into the most unusual of locations (reversing down steep driveways included). We do our darnedest on hills, through venues and backyards, but sometimes we just work with a slight tilt. 15 || The night Jen’s phone ended up in a bin skip, but the night was saved with the ‘find-my-iPhone’ app, and lots of bin fishing. 16 || Creating a full cocktail menu sourced from the clients own herb garden, personally picked by us! WORK WITH GATHERING EVENTS AND JOIN OUR STORIES!